Marsa Alam, situated about 260 km south of Hurghada, was not that long ago just a sleepy fishing village. Since ancient times this heart of the Red Sea was waiting to be opened up and discovered. Now the time has come to explore this attractive tropical paradise with beautiful palm trees, golden sands, shining seacoasts, crystal clear waters, magnificent coral reefs and a blazing hot desert with hidden archaeological treasures and surprises. The warm, crystal clear waters of the Red Sea occupy part of the Great Rift Valley and are famous for hosting an incredibly diversity of sea life. The vibrant coral reefs are teeming with brightly-coloured tropical fish of all shapes and sizes, including clown fish, butterfly fish, angel fish and scorpion fish, as well as barracuda, Napoleon wrasse, moray eels, shrimps and hundreds of eagle rays. Elphinstone Reef is the mythic dive site of the south, easily accessible by day-boat. Packed with all types of marine life, its sheer, coral encrusted walls plunging down to over 70 m. The walls plunge deep into the blue, richly decorated with soft, bright pink, red, white, and brown corals, sponges, gorgonia, and fans. The reef is famed for attracting sharks, particularly white-tips sharks, along with barracuda, numerous big jacks and even tuna. Divers here also commonly spot hammerhead, grey reef and silky sharks around the deep drop-offs. The eastern and western walls of Elphinstone reef are blanketed in soft coral. Abu Dahab is shallower and sandier. It’s easier for the novice diver and still offering the possibility of close-up encounters with dolphins or dugong ‘sea cow’. This is a large reef just in front of the town. Corals gardens have formed near huge coral blocks, ‘porites’, and there are shoals of banners, goatfish, snappers and jacks. A horseshoe shaped reef, which creates a shallow turquoise water lagoon where a large herd of spinner dolphins live permanently. Others often show up around noon for a rest and to teach their babies how to hunt. Several dives are found on its outer walls. The western tip provides a large group of pinnacles rising to the surface from a carpet of sea grass, populated by schools of reef fish. This is a huge round reef with a lighthouse more than 65 km away from the coast. Excellent place for spotting big pelargics all around its steep walls with an extreme variety of fish and coral. Strong currents are possible. This is a big reef with big walls, hammerhead and grey reef sharks in summer; malabar grouper, barracudas, and schooling reef fish the rest of the year. Also present are currents, soft corals, and giant fans. On ‘Fury Shoal’ group, this reef has a good hard coral garden on the north side, and a wreck of an old tugboat fully covered with corals leaning on a pinnacle on the south side. Good dives on both north and south plateaus, with strong currents, which favour the growth of all types of coral, including black, soft and fans. Sharks, napoleon, and tuna thrive here. Sataya is a huge barrier reef that offers a sheltered inner lagoon and shear walls on the outside: schooling hammerhead, large tuna and jacks. Imagine an enormous mountain coming out of the water, surrounded by a lagoon and circling reef including a couple of wrecks and some decent diving with a great variety of both corals and reef fish. As a tiny rock emerging a few feet out of the water, it offers one of the most incredible underwater scenarios of the whole Red Sea. Steep walls falling into the deep blue, currents, soft corals, a great abundance of pelargics, and all kinds of fish. The wind conditions in Marsa Alam are excellent for kite and windsurfing. The strong thermal winds, flat and crystal warm waters, shallow lagoons, unbelievable colours and unspoilt beaches are a dream for every surfer. 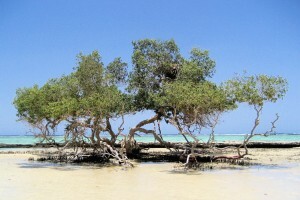 The area hosts a national mangrove marsh land, amazing desert views and an outer reef ideal for a few tricks. And how about kite surfing at the legendary shallow lagoon at Wadi Lahami, about 140 km south of Marsa Alam? Unusually for Marsa Alam the sand is soft and coral free and with a maximum depth of 70 cm across most of the lagoon it’s possible to wade out a considerable distance. There is an outer coral reef at the point at which the lagoon meets the sea. While beginners stick to the lagoon, experts can enjoy the open seas beyond the reef. You stand a good chance of getting a good catch in these fish rich seas. Although not considered a big game fishing water body, the Red Sea is ‘active’ almost year round. Probably relative calmness, diversity of species, rich bottom structures, and the warm climate contribute to this. Red Sea fishing trips range from day charters to full week safaris. Longer time not only means more time to enjoy fishing and better chances to catch, but also possibility to reach remote and more rewarding fishing spots. Depending on take-off point (e.g. Hurghada, Sharm el Sheikh, Marsa Alam, Gulf of Suez, or wild south) some good fishing spots may be as close as 2 hours or as far as 6 hours from the marina. Ideal bottom structures make trolling on the way in and out rewarding in many cases. In addition, boats troll specific spots (such as drop-offs, and reefs) at the best two time of fishing – early morning and late afternoon. The best fishing seasons are February to the end of July and mid October until the end of January. Deep sea fishing for common species such as king, barracuda, mahi mahi, groupers, sail (rare), giant trevally, needle, trigger, etc. So, board a yacht for an exiting fishing trip while enjoying the nature and beauty of the corral reefs and the small islands. If you have always dreamt of swimming with dolphins in their natural habitat, then this is your change. If you have a good swimming ability, you can head over for half a day or more to Samadai Reef. This crescent-shaped coral reef protects a shallow turquoise lagoon and is otherwise known as the ‘Dolphin House’. The Samadai Reef is permanently inhabited by a pod of over 100 spinner dolphins. These beautiful resident marine mammals are extremely friendly. Get up close to these beautiful, intelligent creatures and enjoy the experience of a lifetime. Watching their exquisite movements and listening to a symphony of sound you feel part of their magical world. 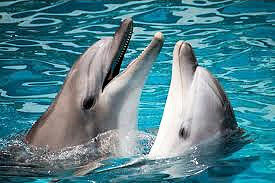 These dolphins are shy but still happy to play with nice people for many hours on end. Marvel at their beauty and grace as they leap out of the water, impressing you with their acrobatic tricks above the waves. You may even get the chance to come face to face with the dolphins as these curious but gentle creatures are likely to approach you. Because the dolphins roam wild and free here, sightings are common but not guaranteed. On average, there is an 80 % success rate. Fortunately, the Samadai Reef is protected by the government and an environmental patrol is in place here every day to monitor swimmers and boat traffic. There are various zones for diving, snorkelling or swimming plus a closed area wherein wild dolphins are free from human intrusion. Trips to the desert can be great adventures and full of surprises. The desert is the home from several Bedouin tribes and clans. The nomadic Bedouins with their camels, sheep, goats and donkeys succeeded for centuries know how to live in harmony with desert’ nature. Their habits and customs hardly changed till today. On most of the trips you get the chance to visit a Bedouin Tribe. A visit to a Bedouin settlement is a learning experience. Sip their Bedouin herbal tea. Learn how they brew coffee over an open fire and bake bread in hot ashes in the sand. See the sun set and a crescent moon appear in the clear desert sky. Have a Bedouin barbeque dinner, sing traditional songs around the campfire and circle dance under a black velvet heaven with a millions of glittering stars in it, before you go to sleep and experience the silence of the desert. Hospitality and friendship are the fundament of the Bedouins tradition. The Quseir Fortress is located in the town centre of Quseir. It was built by the Ottoman Sultan Selim in the 16th century for protecting trade links with India. The fortress underwent many fortifications in later years even as it changed hands. In 1799 Napoleon’ troops occupied the fortress. The French fortified the fortress with cannons high up on the walls and also built a new viewing platform. After a few years the British took over the fortress from the French after a fierce battle. The British constructed a new gate to the fortress. The fortress retained its strategic importance up to the time when the Suez Canal was opened in 1869. Today the fortress houses the new Visitor Centre that displays the local history, culture and archaeology of the surrounding region. The historical settlement of Myos Hormos, located 8 km north of Quseir, was a major port during the Roman era and the main gateway to India and East Africa. The port’s history dates back to the 3rd century BCE. It was constructed during the Ptolemaic period. Roman storage jars or amphorae, pottery and other artefacts recovered from the site, point to a once thriving past. Historians reveal that during the time of Augustus, 120 ships set sail for India every year from the port carrying wine, glass, metal, textiles and pottery and brought back spices, silk, pearls, medicines and other goods. The foundations of ancient port structures are still visible and a number of traces of empty Roman storage jars can be seen. Pottery shards, which support the evidence of prosperous economic activity, are scattered all over the area. Along the desert road to Marsa Alam, at Kanais in Wadi Abbad, lies a small rock-cut temple built by Seti 1. You can only view the entrance of the temple. The chamber featuring splendid sketches of Seti 1 fighting with his enemies and offering a gift to the god Amun inside the cliff, can not be visited in order to protect it against mutilation. High waterless mountains, a valley alternately dry and flash-flooded, mangroves forests, palm groves, a salt marsh, sand dunes, white sandy beaches with crabs scuttling in the waves, a coral reef, a sea-grass bed, four offshore islands; Wadi Gemal National Park contains a diverse range of ecosystems supporting a wide variety of plants and animals. Wadi Gemal National Park or the Valley of the Camels opened in 2005. 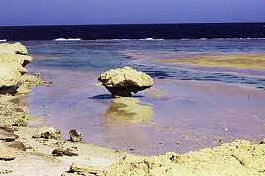 It is a protected area about 40 km south of Marsa Alam. It is one of the last places in Egypt you can still find wild gazelle. The park stretches almost 100 km along the coastline. The park also stretches into the desert and covers a 60 km deep dry riverbed. What the park showcases is nature at its pristine best and the surprising number of animals that live in the desert, including the African donkey, Syrian ibex, wild camels, scorpions, sand cats and snakes. On a regular base there are guided park tours. You can visit the beach and mangroves from the coastal road, or take an organised trip by camel or four wheel drive to see the wadi and the mountains. The scenery is spectacular and a surprising amount of wildlife lives here. Accommodation is provided in eco-lodges. The area around Marsa Alam was once rich in deposits of copper, lead, gold, emeralds and semi-precious stones. Once it was one of the most famous and oldest mining complexes of the ancient world. Most historians think that the emerald mines were already in use during the Ptolemaic period, some even arguing that the history of the mines may go back as far as the second millennium BCE. It was for sure the sole source of emeralds for the Roman Empire. By this time there were at least nine mining villages across an area of seventy square kilometres with the biggest two at Nuqrus and Sakait. The Romans called the area ‘Mons Smaragdus’ or the ‘Mt. Emerald’, but it is more popular know as Cleopatra’s Mines. Emerald is the oldest known gemstone. The deep green colour is thought to be a symbol of power and eternity. So, emeralds were highly valued to the ancient Egyptians. Some places where emerald was mined extensively are Wadi Gemal, Wadi Sakait, Wadi Nuqrus and Mt. Zubara (Mons Smaragdus), all situated in what we call now the Wadi Gemal National Park. You can still explore the old villages, the connecting pathways and even the remains of the mine shafts. Nearby is a small Ptolemaic rock temple, dedicated to Isis and Serapis. Another hidden treasure, about 145 km south of Marsa Alam, in Wadi Humaysara, is the ancient tomb of the 13th century Sufi Sheikh Sayyed el Shazli, who is known outside Egypt as Sheikh Abul Hassan el Shazly. He was one of the more important Sufi leaders. Legends tales that El Shazli wanted to be buried in a place, where no one has ever sinned, justifying why his tomb is built in the middle of nowhere. You can enjoy a memorable and authentic experience by attending his Moulid, a celebration marking a saint’s birthday. It is celebrated on the 15th day of the Islamic month of Shawal. If you are a nature lover you might want to explore the amazing landscapes and wildlife of the Elba National Park which lies between Berenice and Egypt’s border with Sudan. This mountainous area harbours a surprising variety of bird species including the Sooty Falcon, the Crowned Sand grouse and the Pharaoh Eagle Owl. Its’ highest peaks, including Mt. Elba (1,435 m), form a ‘mist oasis’. The surrounding cloud that shrouds the mountain tops creates moisture laden dew. This is the reason for the relative abundance of local flora, fauna and wildlife. The area is also the homeland of the Bashari pastoral nomads whose numbers have been declining due to a recent drought. They live in semi-circular wooden structures patched over with hides and cloth and are renowned for their skill as desert trackers and camel breeders. Shalatin Market, a trading place, lies within the boundaries of Elba National Park. It has the most important tribal market in this part of southern Egypt. It is a melting-pot of different cultures. Sudanese bring camels and mostly handmade items, trading them for necessity goods not available in their country. You will meet the Rashaida, a wealthy Arab tribe completely dressed in violets, who are the main camel breeders. The Bisharin and the Ababda are tribes that have their origins further south. They carry a whip or a dagger as symbols of their status. After finishing their business they return to which ever remote places they came from. Little shops are spread out over the market area with an incredible amount of various goods. Marsa Alam is around 250 km from the most famous ancient capital of the ancient world – Thebes – or Luxor. So, if you visit Marsa Alam you could easily plan a short trip to this ancient capital. Luxor has so many temples and historic monuments that it is virtually one enormous open air museum of Pharaonic Egypt. What about seeing the Valley of the Kings, Hatshepsut Temple, the Temple of Karnak or Luxor Temple! But it has a lot more to offer. Here you can engage with local Egyptian town life and its people. You can submerge into the souk looking for just that one present for home or drift down the Nile in a felucca enjoying the cool breeze of the late afternoon as the sun sets.